By using the button "contact" you can send questions to the Hubble Europeans Space Agency Information Centre. A selection of answers will be published on the page below. How many observations has Hubble made over the years? Why do some Hubble pictures have a strange staircase-like shape? What is your copyright policy? Can I use images or videos from Hubble on my website/project/TV programme? Does Hubble ever get hit by space debris or can it be affected by adverse space conditions? Why do stars have a cross-shaped distortion in most Hubble images? Why do galaxies not? How do you protect and clean the lens of the Hubble Space Telescope? Will Hubble be brought back to Earth when it has served out its usefulness, or will it be destroyed? What is the expected lifespan of Hubble? How can I view the “broadcast quality” videos on spacetelescope.org? 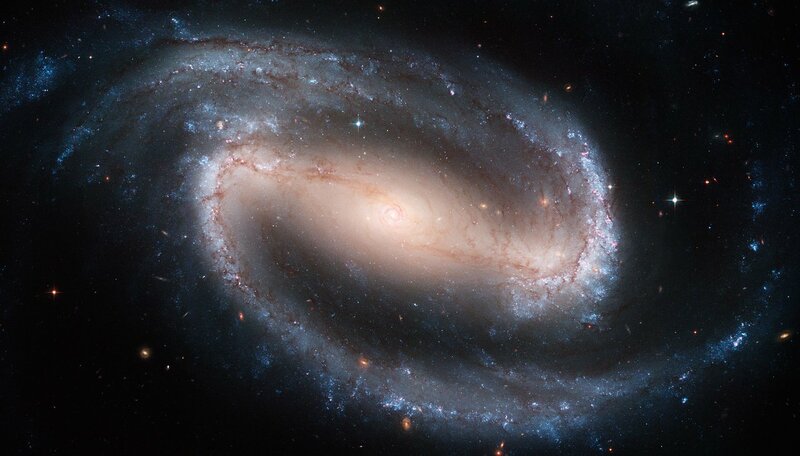 Of all the stunning photos captured by Hubble, which is your favourite? Do you think Hubble is still necessary? Why is Hubble able to see so much better than telescopes on Earth? I heard that Hubble had problems during its first few years. What really happened? What are the Hubble Deep Fields? If the Hubble Space Telescope pointed to Earth, what resolution would the images have? What will be better about the James Webb Space Telescope? What has Hubble found out about the beginning of the Universe? Can Hubble take a picture of the landing site of the Apollo missions? Given the latest advances in Hubble instrumentation, image processing etc., what would the absolute theoretical limit for the smallest object visible on the Moon be? As the Big Bang could be similar to a conventional blast, and therefore the Universe developed around it, how is possible to state that there is not a centre of the Universe? How is possible to take a picture of the most ancient radiation and see it as it were around the photographers (Hubble and then us)? How high up is Hubble’s orbit? How are the Hubble images in the image archive created? In Summer 2011, Hubble passed the landmark of its millionth observation, by making a spectroscopic analysis of the atmosphere of exoplanet HAT-P-7b. Nearly 4000 observing programmes have been carried out or are pending since launch in 1990. Hubble has a number of instruments on board — essentially, advanced digital cameras — that have been regularly upgraded and replaced during the five servicing missions to Hubble. The Wide Field and Planetary Camera 2 (WFPC2), which was operational between 1994 and 2010, produced images with an unusual staircase-like shape. Note that many of the images on spacetelescope.org are cropped and so do not have this shape even if they do come from WFPC2. Yes, although it has never experienced serious damage. In Hubble’s lifetime, the solar panels have been replaced several times, and the old panels brought down to Earth. Close inspection of these shows small cracks and chips on the surface caused by tiny particles that have hit Hubble. There is also a small hole (around a centimetre in diameter) on one of the high-gain dish antennas on the telescope, caused by an unknown object hitting it! The radiation that Hubble is exposed to in space also causes some degradation to its instruments, though this is mitigated since the instruments have regularly been replaced throughout Hubble’s life. Coronal mass ejections from the Sun are not a major risk, as it is in a low enough orbit that the Earth’s magnetic field provides protection. The cross shape visible on bright objects (such as stars) in Hubble images is a form of distortion that is visible in all telescopes that use a mirror rather than a lens to focus light rays. The crosses, known as diffraction spikes, are caused by the light’s path being disturbed slightly as it passes by the cross-shaped struts that support the telescope’s secondary mirror. It is only noticeable for bright objects where a lot of light is concentrated on one spot, such as stars. Darker, more spread-out objects like nebulae or galaxies do not show visible levels of this distortion. Hubble doesn’t have a lens. Like all large telescopes, Hubble uses a curved mirror to focus starlight. This mirror is located deep inside the telescope, protected by its long tube-like structure. As there is no atmosphere around Hubble, there is no risk of dust or corrosion reaching inside. With the retirement of NASA’s space shuttle fleet in 2011, there are no spacecraft currently in operation that could collect Hubble and return it to Earth. Hubble’s orbit is relatively stable, so it will not be immediately de-orbited when it stops working. However it will eventually need to be brought down in a controlled re-entry to ensure that any debris does not land in inhabited areas — Hubble is too big to fully burn up in the atmosphere. During the final servicing mission in 2009, a docking device was fitted onto the base of the telescope so that a rocket can easily attach and safely de-orbit the telescope once its mission is complete. The last, and final, servicing mission for Hubble took place in 2009, and the space telescope is still doing very well. As such, there is no set date for Hubble’s retirement. Hubble will continue to work for as long as its components operate and it provides a good service to the scientific community. “Broadcast quality” videos on spacetelescope.org are encoded in HDV format, which is a specialised format for high quality HD video. Professional video editing software is usually able to handle this. Home computer software is, however, frequently not designed to play it, so we recommend that home users view one of the other options for HD video available on our website. Please note that ESA/Hubble is not able to offer general technical support on these matters. The telescope itself has no limit to its range — but the Universe itself does. Hubble is a medium-sized (2.4-metre) telescope with very sharp optics and very good instruments. This enables the telescope to see very faint objects despite its relatively modest size. According to the theory of the Big Bang, the absolute observational limit to telescopes (as we know them today) is a “sphere” of opaqueness surrounding us and with a “surface” approximately 13–14 billion light-years away. It is called the surface of last scattering, and is also known as the source of the microwave background radiation. Up to 300 000 years after Big Bang, the Universe was totally opaque to light. This means that we know that, when we look out in the Universe and thus back in time, we will never see past, or through, this barrier. The most remote object spotted by Hubble is a galaxy called UDFj-39546284, which was spotted as a tiny speck of light in the background of a series of observations made in 2009–2010 (heic1103). While this result awaits spectroscopic confirmation, the astronomers who made this discovery are confident that it is the most remote object ever to be identified. It is at a redshift of around ten, which means that the light from it has taken 13.2 billion years to reach us — about 96% of the way back to the Big Bang. In the coming years, especially with Hubble’s successor, the NASA/ESA/CSA James Webb Space Telescope, more distant galaxies will undoubtedly be detected, but the limit for our observations will not progress dramatically further back for two reasons. Firstly, galaxies have to have time to form stars after the Big Bang (this takes several hundred million years) before we can see them. Secondly, the young galaxies will be shrouded in large amounts of gas and dust that obscure our view of the early Universe. Hubble currently provides the best resolution in the optical and ultraviolet (UV) wavelength range in the world. This is extremely important for the identification of interesting objects. Adaptive optics techniques can be used with ground-based telescopes to obtain a similar or even superior resolution to that of Hubble, but only for small fields of view and in the infrared wavelength range. As mentioned, Hubble provides access to the ultraviolet wavelength range. The UV light is blocked by the Earth's atmosphere, so observations in the UV can only be performed from space. They are very important for our understanding of the physical processes that take place in astronomical objects. Because it is above the Earth's atmosphere. The atmosphere disturbs the starlight (a bit like looking through water) and blurs the images. So Hubble's images are much sharper than those from other telescopes. Also, Hubble is able to see in ultraviolet wavelengths that are blocked by the Earth’s atmosphere. Yes, it is true. 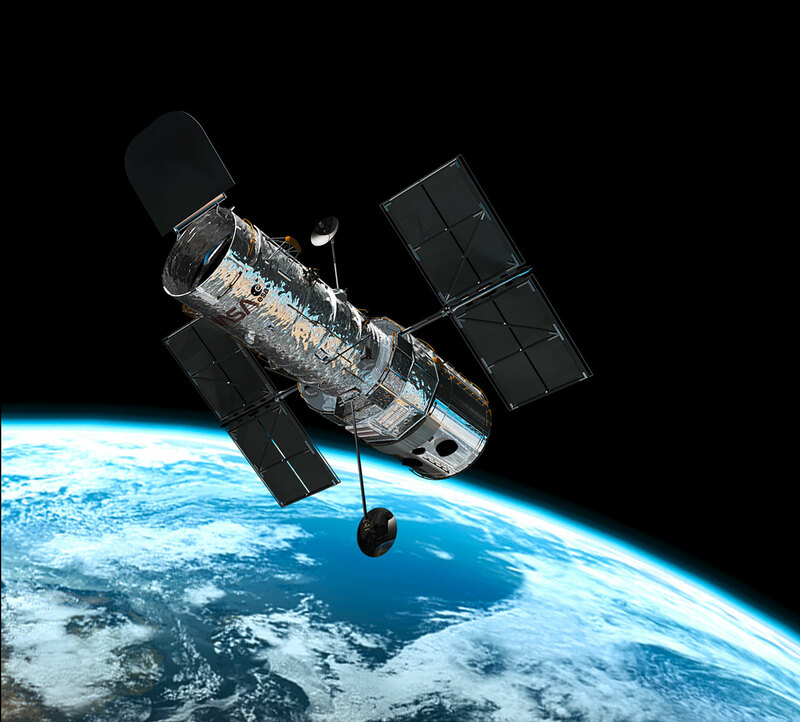 During its first three years Hubble suffered from what is known as spherical aberration. Spherical aberration is an optical defect and Hubble's main mirror is two microns too flat. The problem was caused by a faulty measuring device used during the process of polishing the mirror. During Servicing Mission 1 the problem was solved by installing an extra optical device in Hubble called COSTAR. This used a series of curved mirrors to correct the light path between the mirror and Hubble’s instruments. In subsequent missions, Hubble’s instruments have all been replaced with ones with built-in optical correction, meaning COSTAR was no longer needed. COSTAR was removed during Servicing Mission 4 in 2010. Hubble’s mirror still has the flaw, but it is completely corrected for by the design of Hubble’s current instruments. Hubble has made a series of very deep observations taken in very dark parts of the sky. Like using a long exposure on a digital camera, these long exposure shots (up to several weeks) reveal very faint details that are not normally visible in shorter exposures. The Hubble Ultra Deep Field — Infrared is the deepest ever view of the cosmos, and reveals galaxies so distant that their light has taken around 96% of the age of the Universe to reach us. Hubble's so-called angular resolution — or sharpness — is measured as the smallest angle on the sky that it can resolve (i.e. see sharply). This is 1/10 of an arcsecond (one degree is 3600 arcseconds). If Hubble looked at the Earth — from its orbit of approximately 600 km above the earth’s surface — this would in theory correspond to 0.3 metres or 30 cm. Quite impressive! But Hubble would have to look down through the atmosphere, which would blur the images and make the actual resolution worse. In addition, Hubble orbits the Earth at such a rate that any image it took would be blurred by the motion. In the past Hubble was pointed towards Earth several times to calibrate some of its instruments. JWST will not be a like-for-like replacement of Hubble. The biggest difference is that it will be optimised for observing infrared light (with limited visible light capabilities), while Hubble is optimised for visible and UV light (with limited infrared capabilities). 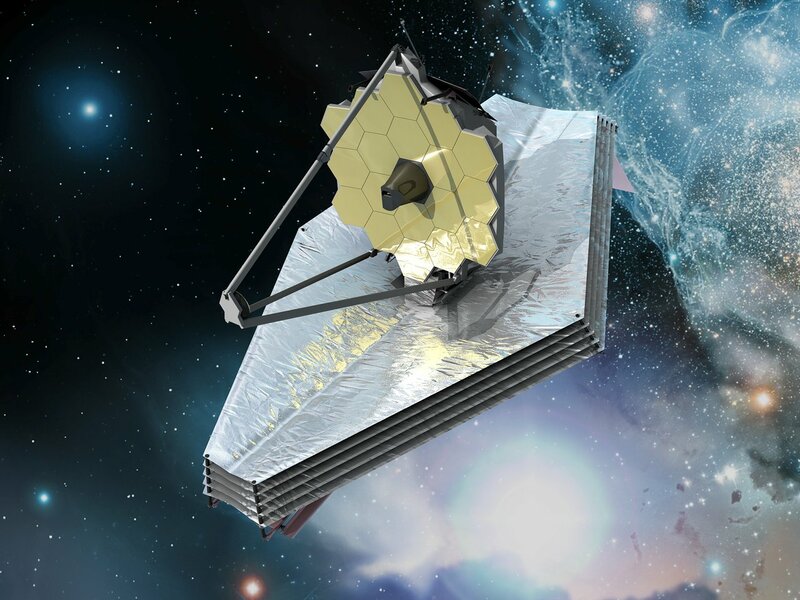 With a bigger mirror and more advanced instruments, JWST will easily exceed Hubble’s ability to image in the infrared. This means it will be better at looking through dust and gas clouds, which is useful for studying star formation. It will also be much better for studying highly redshifted objects, and is therefore expected to make major contributions to the study of the very early Universe. This is a bit difficult to explain in just a few sentences. Hubble has measured the age and size of the Universe better than before (by refining the value for the Hubble constant, which is related to the expansion rate of the Universe). It has also seen details which are not visible from the ground in the first galaxies. Today we know that galaxies were formed earlier than previously thought and most scientists also believe that they evolve by colliding and merging together. There have been a few cases where Hubble has been aimed at the Moon - see here. This has to be done with the greatest care (since the Moon is very bright), and is normally avoided. Even with Hubble's incredible sharpness (resolution) only objects the size of a football field can be seen (~100 metres)... so no Apollo spacecraft would be visible. To see the surface of the Moon in enough detail, you simply need to get nearer to the lunar surface than Hubble is (Hubble is not significantly closer to the Moon than we are here on Earth). NASA’s Lunar Reconnaissance Orbiter is a robotic probe that is currently making detailed observations of the Moon’s surface from an orbit only a few tens of kilometres from its surface (the Earth is around 400 000 kilometres from the Moon). The Apollo landing sites are visible in these observations. See the images here and here. Firstly we should say that a bright, high-contrast feature such as a star can be seen however small (in angular terms) it appears. In these cases the star would just appear as a dot. So, if there were a very shiny surface on the Moon that caught the Sun, it might be seen from Earth with quite a small telescope. R = λ/D, where R is the angular resolution in radians and λ is the wavelength in metres. The telescope diameter, D, is also in metres. R (in arcseconds) = 0.21 λ/D, where λ is now the wavelength in micrometres and D is the size of the telescope in metres. R = 0.21 ｘ0.300/2.4 = 0.026 arcseconds (for ultraviolet light, 300 nm). Note that the resolution gets better at shorter wavelengths, so we will use the second of these numbers from now on. So the minimum separation of two objects on the Moon that could be seen as separate when observed by Hubble in the ultraviolet should be about 40 metres. Unfortunately it is very difficult for Hubble to observe the Moon — because the telescope is rapidly orbiting the Earth the Moon appears to swing backwards and forwards in the sky very rapidly and it is almost impossible for the telescope to compensate — so it is unlikely that this limit could ever be approached. The similarity of the expansion of the Universe to a conventional blast is a typical misconception in the popularisations of the cosmological model, possibly due to the unfortunate choice of the name Big Bang. The expansion of the Universe is totally different from a conventional blast, which happens within a given space. The expansion of the Universe is the expansion of spacetime itself, together with its energy–matter content. Admittedly it is not easy to imagine the correct scenario, because it is so different from our experience of everyday life. An additional difficulty related to the second question is that this is due to the fact that the velocity of light, although very high, is still finite (~ 300 000 km/s). Therefore, if we look at objects which are at some distance from us, we see them as they were sometime ago, the elapsed time being exactly the time needed by the light to reach us. For example, the most recent image of the surface of the Sun that we can observe is always at least eight minutes old, because it takes about eight minutes for sunlight to reach the Earth. If you look at the stars in the constellation of Orion, which are roughly at a distance of 900–1000 light-years, you see them as they were 900–1000 years ago. If some of them exploded today as supernovae, we (or our descendents!) would only find out about it after nearly a thousand years. This explains (we hope) why we can see pictures of the very old Universe: we just have to have powerful enough telescopes to look very far away. The Space Shuttle Discovery (STS-31) deployed Hubble into a circular orbit approximately 550 kilometres above the ground and at a 28.5 degree inclination to the Equator. The telescope whizzes around Earth at 28 000 kilometres an hour, taking just 96 minutes to complete one orbit of our planet. Like any modern telescope, Hubble captures images on a digital device that transforms photons into electrons; and the latter carry no colour information. However, filters placed in front of the camera only allow for specific kinds of light (blue or green light, infrared light or ultraviolet radiation) to pass through them and into the camera. Therefore, most of the images found on spacetelescope.org are actually a combination of several identical images, each taken through a different filter. To create the final image, these individual images are coloured — depending on the type of light they represent — and then combined with the others. We colour the images as accurately as possible to correspond with the filters, but sometimes this is not entirely possible. For example, we can not accurately represent those colours invisible to the human eye, such as infrared and ultraviolet light. Therefore, in this case, the filters are represented by colours we can see — though the final image does not represent what the human eye would see if it looked upon the subject in the night sky. Data from Hubble is also contaminated with defects, such as bright pixels — caused by high-energetic particles — and dead pixels, which no longer collect light and noise. These defects are removed to create those images released to the public.